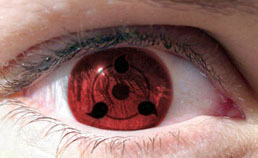 Get the Uchiha clan look with Sharingan style contact lenses. These anime/manga lenses are an extremely popular choice for fans of the Naruto series. As well as Sharingan contact lenses, we have a page for anime contact lenses in general. If you are looking for lenses for a Halloween costume please see the Halloween lenses page, or the special effect lenses page for all special effect contact lenses.